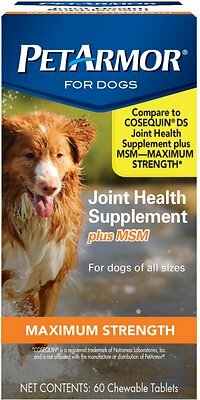 PetArmor Joint Health Dog Supplement Plus MSM Maximum Strength Chewable Tablets help support healthy joints and strengthen bone cartilage. 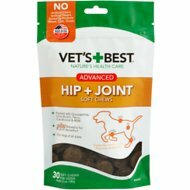 These tasty tablets contain chondroitin and glucosamine to help cartilage and related connective tissue perform properly. The full combination of glucosamine, chondroitin, MSM and manganese delivers maximum support to help your pet maintain a normal, active lifestyle. My dog, a shepherd/husky mix, 45lb, has arthritis in one knee and instability in the other. Her daily dose of two tablets, along with fish oil capsules, has increased her mobility to such a degree that she no longer needs her carprofen. Good quality glucosamine supplement for a good price. I’ve done some research and this is the best bang for your buck. My 14 yr old Golden Retriever started having some problems climbing on the couch and walking. I started giving him 1 of these per day and he’s back to his old self, walking 20 mins twice daily. Our dog seems to like these. I have been giving her supplements for a few years now and plan to continue. Have used the product for a year or more and the store quit carrying it so went right to the source, ship fast and dogs like the pills. 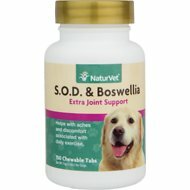 Our 2 GSD ages 5 & 7 are doing well with this supplement. Previous joint problems are much better.